This server is an abstracted fish. The blade is an asymmetric trowel shape with a gentle curvilinear form that captures the "fishy" essence. 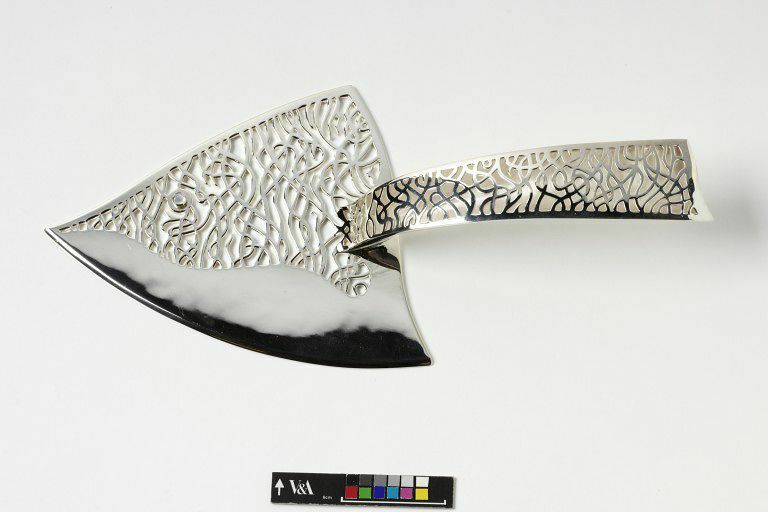 It is bevelled on the left side and over half of the blade is pierced in an intricate swirling pattern suggestive of seaweed. This piercing is continued along the topside of the hollow handle, giving a pleasing unity to the piece. The triangular cross-section and straight end offset the natural curves of the blade. 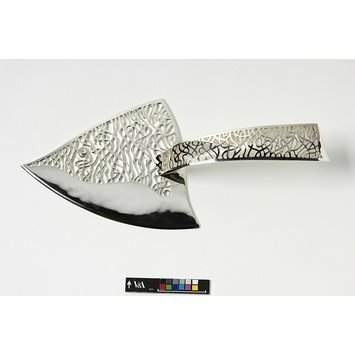 The interior of the handle, visible through the piercing has been given a white matt finish that subtly highlights the white moonstone eye of the blade, suggesting light glancing off the scales of a fish. This delightful piece has a sense of movement and action created by the fluidity of form and the freedom of the piercing. The blade is an asymetric polished trowel that has two slightly waved contours, right and rear, and a gently convex bevelled left side. Somewhat over half the blade, leaning to the right, is highly pierced in a rambling, curving slit pattern that carries up continuously into the top side of the handle. The latter has a tapering, triangular cross section and a waved rear edge. The handle passes into a conforming slot at the rear edge of the blade. The interior of the handle has been pickled to a white, matt finish, while visible through the piercing. The blade is decorated with a small up-pointed moonstone set into the pierced area. Historical significance: Thomas' work is "an ongoing search for the perfect combination of lines, curves and balance." The artist seeks to design in a multi-layered way so that his pieces reveal something new on each viewing. He combines "composure, grace and …humour" in his work. Silver, Sheffield hallmarks for 2005, mark of Barry Thomas. Benton Seymour Rabinovitch, Contemporary Silver, Part II: Recent Commissions, Seattle, 2005, pp. 40-41. ill.